Mrs. Siemon is many things- a social studies teacher, a history enthusiast, and a world traveler. When I first walked into Mrs. Siemon’s office, I noticed what I can only describe as organized clutter. Papers and files were everywhere, and she was hard at work on her computer. There were pictures all over the wall, mostly from famous mosques, in countries such as Israel, Egypt, and the United Arab Emirates. Even in this mess, everything looked like it belonged in the tiny office. All of these decorations show her love for the cultures and people she studies. Mrs. Siemon’s quiet passion for history began in elementary school. She claims that she was that one classmate who knew all of the British kings and queens throughout history. Her free time was spent in the library reading history books, but unfortunately, she did not have much of an opportunity to expand her knowledge in high school. Her high school teacher always had them read directly from the textbook, and there were never any in-class discussions such as the ones we have at Dana. Stuck in that class, Mrs. Siemon thought that “anyone could do better” than that, so she decided to take on the challenge of being a history teacher. History has to be more than a study of the past. To be a good history teacher, you need to understand about current events, and Mrs. Siemon took this to heart. While in college, she protested against the Vietnam War. She explained that her future husband at the time was registered for the draft. She explains that the draft was a birthday lottery. For example, every man born in March 14th might have to go to war, and then every man born on July 3rd. People would sit and wait in anticipation to see where their birthday was for the draft. It was a terrifying time. Mrs. Siemon told me that she disagreed with the war because, “It was a war not against an ideology but a war against people who wanted to be free.” Her father may have initially disapproved of her choice to protest, but he also told her that, “There is more than one right way to learn, not one right answer.” Whether or not you agree with the United States fighting in the Vietnam War, I think we can all appreciate this sentiment. By taking part in these protests, Mrs. Siemon was getting an immersive education in United States politics by participating in protests that actually caused change. Oh, and that man who almost got called up for the draft? She married him, and he became a professor at Boston University. Family is also an important part of Mrs. Siemon’s life. Since her husband is a professor at Boston University, she has a lot of discussions with him about teaching. Together they have four children, one of whom is a lawyer who is currently arguing her first Supreme Court case. Mrs. Siemon enjoys reading, gardening, and knitting in her free time. She also likes to play with her dog, Thisbe. Thisbe is named after the female lead in the play A Midsummer Night’s Dream by William Shakespeare. Thisbe was named because she is, in Mrs. Siemon’s words, kind of funny-looking, so a more elegant Shakespearean name such as Juliette or Desdemona simply would not do. I don’t know about you, but I think that’s just adorable. But Mrs. Siemon isn’t just a history teacher who is good at naming dogs. She’s also travelled the world. Mrs. Siemon has been given grants from the government to travel across the Middle East. She has spent summers in Syria, Egypt. She also traveled to Saudi Arabia through grants. All of these places gave her the opportunity to immerse herself in the culture, and this shows in her classroom. Many of the photographs lining the walls are pictures she took on her adventures. Her students know that she will often sprinkle in photos she’s taken abroad in her infamous smartboard notes, such as when she visited a monastery in Syria. 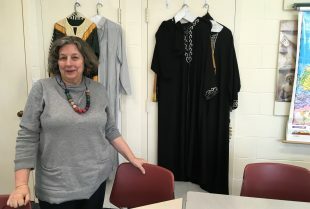 Even the clothing hung on the wall was purchased while she was abroad, which gives her classroom a warm, welcoming vibe. It feels like you’re being fully immersed in the culture. A world traveler, political protester, and history nerd, Mrs. Siemon certainly has a lot going on behind the scenes.